What in the world are the dingbats at HHS/CDC/FDA and Big Pharma thinking and implementing in mandating pregnant females receive vaccines which have not been tested for the very horrors pregnant mothers—or anyone else—would want to consider IF they knew the truth about those vaccines? Below are vaccines pregnant females must receive only relatively recently; the information is taken from vaccine package inserts online. 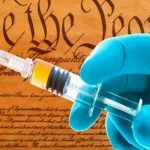 Each vaccine has a Section 13 Nonclinical Toxicology wherein the vaccine manufacturer bold-faced tells the FACT that testing for the vaccine’s capability to cause cancer, birth defects and to interfere with human reproduction HAVE NOT BEEN DONE and, apparently, will never be done, so as to be able to make unknowns a given without legal liability! Is that a fraudulent practice by medicine and pharmacology? Carcinogenesis, Mutagenesis, Impairment of Fertility M-M-R II has not been evaluated for carcinogenic or mutagenic potential, or potential to impair fertility. Based upon the above information, why aren’t allopathic medical doctors demanding proof of vaccine safety from CDC/FDA and Big Pharma regarding any vaccines ability to cause cancer(s), birth defects and interfere with fertility? Where is congressional oversight, or is Congress afraid if they investigated, they’d lose their election campaign funding? According to Open Secrets, during the 2016 election cycle, the industry gave over$16 million to 399 members of the House of Representatives, an average of more than $40,000 per member. They also gave more than $7 million to a total of 97 senators, at an average of roughly $75,000. If only truth be told!